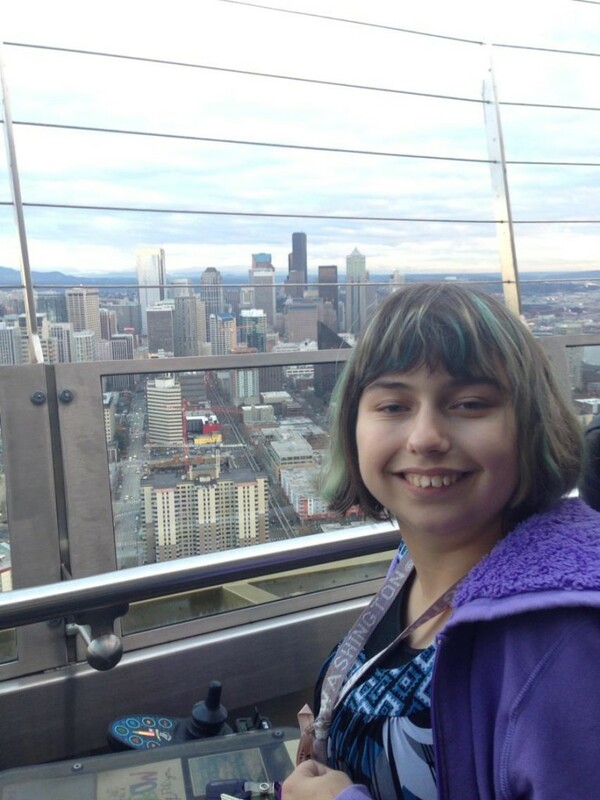 Hannah Langlie at the top of the Space Needle in December 2012. Junior journalism student Hannah Langlie is on a mission – a mission to show everyone that traveling the world with a disability is possible. Langlie has cerebral palsy (CP), a non-progressive movement disorder that means she spends most of her time in a wheel chair. But that has not stopped her from doing things that many college students enjoy. Langlie was accepted to study abroad in London this summer through the English Department at the University of Washington. She started a GoFundMe campaign to raise money to bring a companion with her on the trip. Langlie has visited Europe (London, Dublin, Paris, Bruges, and Brussels) once before and knows that she has to think about many things that most people don’t when travelling. Langlie said there are other factors that people with other kinds of disabilities, such as sensory or learning, have to take into account. Beyond just having the travel bug, she hopes that by teaming up with news sources and writing her own blog, she can document her experience and share what did and didn’t work. She has already written two articles for the Seattle Globalist, giving advice to students with disabilities who plan to travel abroad. Langlie’s goal is to get a job at a publication after gradation either in Seattle or her hometown of Anchorage, Alaska. She is involved with organizations specifically for CP and also for people with all sorts of disabilities, but says she only brings her condition into her writing when it is applicable. “CP is not central, but it is part of who I am,” she said. Langlie’s study abroad trip is June 16 to July 23 – follow along with her experience on her blog here.